I am just being honest here…it feels like we have absolutely NO food in our house. We are somehow still surviving and managing to find things to eat, but man is it desolate. It usually gets down to slim pickings by the end of the budget week, but this time it already started feeling this way on Thursday (with 3 more days to go!). I think it is especially noticeable this time because we are out of some key staples like eggs, cheese, and chicken broth. It seems like whenever I am in a bind my go-to meals are things like quesadillas, quiche, scrambled eggs, pizza, or soup, and it is tough to make those things with so many missing ingredients! So last night I struggled to think of a meal (since my matzo ball soup plan got messed up due to my poor planning), and I ended up making some bread/nut stuffing, butternut squash gratin, and some greens from our garden. 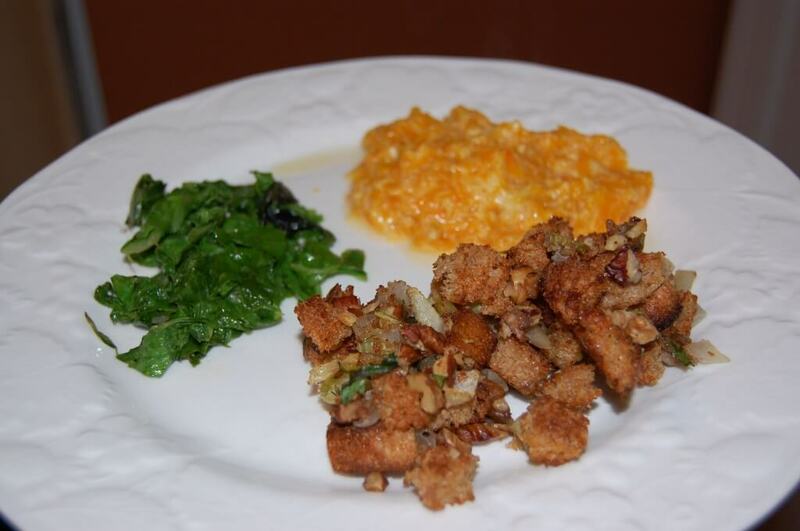 The stuffing had a good flavor, but it was a little dry. The greens were okay for greens. And the butternut squash was AWFUL! None of us liked it and it even provoked my 3-year-old’s (very well rehearsed) gag reflex. I am not quite sure what I am going to do with the leftovers…maybe make a facial mask out of it if I can somehow stand the smell. After dinner I had the daunting task of preparing my kindergartner’s lunch for the next day. Oh the cheap and easy cafeteria school lunch has never been so tempting. But, I did not give in! I felt like I could make a good lunch if I just had some cheese so I asked my husband to pick up “cheap” cheese from the grocery store. I think I may have even said “the cheapest”…at least that’s how I remember it. Now, when someone asks you to pick out something cheap do you think that means to spend the least amount of money possible or buy what appears to be the best value? 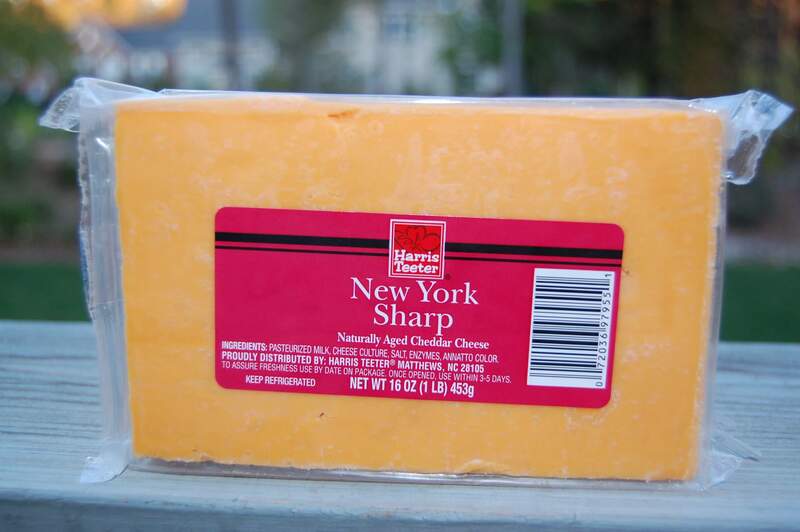 Just curious because my husband not only came home with a huge double-size block of cheddar that cost $4…but it was orange! I haven’t bought orange cheese in 8 months because cheese is not supposed to be orange. I realize it is colored with some sort of natural vegetable coloring, but what is the point of that? I almost wondered if he’s been paying att ention to this whole budget thing. When you have approximately $16 left to spend at the farmer’s market (and you desperately need to spend $3 or $4 of that on eggs) you don’t go spending 2 extra unnecessary dollars on cheese just because it is a better deal. So I just hope this doesn’t mean my husband is going to get out of his Farmer’s Market duties this fall/winter (it’s his turn to go every other Saturday since it starts so darn early!). After the cheese episode I am not sure I can trust him to spend my last precious food dollars that have to get us through the rest of the weekend! And I am going to return the unopened cheese by the way. On a much lighter note I decided to go ahead and roast the chicken tonight that I had been saving for the broth/soup. A reader mentioned that I could make broth out of the chicken carcass (that is such a lovely word) so I will be sure to save the leftover bone s if they don’t gross me out too much! I felt like we might starve tonight if I didn’t go ahead and make the chicken though, plus I didn’t think it would hurt to redeem myself after the meal last night. 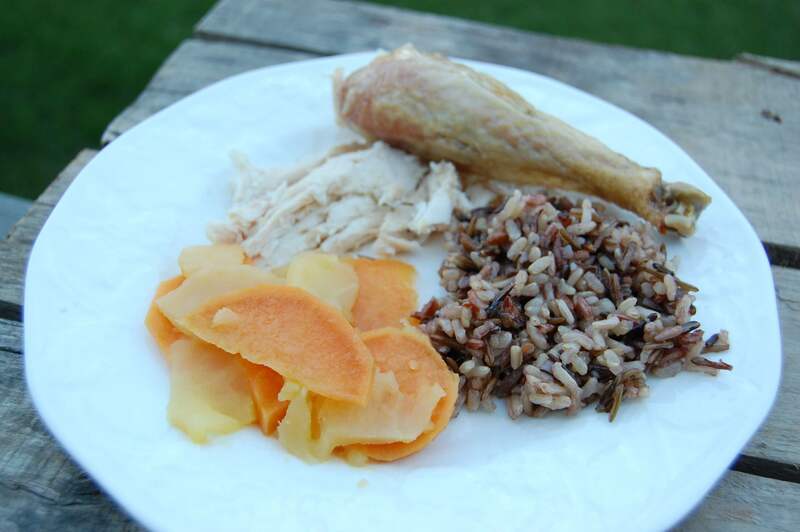 As you can see it turned out just lovely with a side of wild rice and sauteed sweet potatoes/apples, which rounded out the meal nicely. I can’t wait until I get more money on Monday, and I have to be sure I do a little better with the whole meal planning part of all of this!! And if you’ve roasted a chicken and don’t feel like making it just yet-freeze the bones of however-many chickens (and innards) for later use. I can so relate. This is tough stuff, living healthy on a budget! I travel 2-3 days a week and my teens are in charge of cooking, heating leftovers, etc. Typically I cook several meals on the weekend so they don’t have to think about it too much. (that way they do the dishes!) This past week I had run low on $$ and there was little to work with. I felt terrible. The kids made do with couscous and eggs, and some leftover veggies from last week’s farmer’s market run. Just wanted to say “hang in there”, I think we are all struggling with $$ these days. But refuse to give in to cheap and processed! If you have a crockpot the chicken carcass/broth thing is so easy…toss bones in the crockpot after dinner while clearing the plates (I include any non-starchy veg scraps too), cover w/ water, set on low and cook overnight. Wake up next AM and put it aside to cool before going in the fridge. After being in the fridge the fat floats to the top; I skim it and strain the bones/solids then use the stock for soup or risotto. Also, if you add a TB or so of vinegar to the crockpot valuable minerals like calcium & phosphorus will leach out of the bones into the stock, making it all the more nutritious. I will have to try this in the crockpot next time…I am starting to learn that the crockpot is good for so much more than just cooking a big meat dinner! Oh, my… I am still laughing abut the 3 /o and the gag reflex. Having witnessed that before with my stepson…rofl. So what you experiencing with the empty pantry, sadly is more common than you know. Th scarey thing is so many go without protein. Tonight I had a half of speghetti squash with dried tomatoes a 1/8 c of white cheddar and some spices. Thank heavens for the fall crops. I also do the chicken/crockpot w/vinegar.I am one person, but can use that chicken for many meals. Check on prices of shrimp. Great source of protein for the buck. I am glad to know I am not in this alone! And we have pretty much had to cut out all “treats” as well due to lack of money! next time, with your squash: roast it, saute onion & garlic with the greens, add chicken stock and black beans. voila. tasty soup. Or, if you want it to be a side dish, still roast it (coat with olive oil first). the roasting makes it sweeter. add a little maple syrup at end of roast time if the squash doesn’t sweeten up. At the end of this you will have become MUCH more creative in making simple items taste really good. good enough for a 3 year old to eat. Another quick recipe – roasted vegetables and polenta. Add a little cheese to the polenta and your children will inhale it. Your roasted vegetables can be anything you have left — including frozen items. 450 degrees for 15-20 minutes. Polenta, if quick cooking takes about 5 minutes. The squash thing was a little crazy b/c I love it as a soup and also in ravioli. I never imagined it would be so awful the other night. And you are right…creativity (with what you have) is key to this whole budget thing! I was unable to stick to my budget the last few weeks, I am going to keep trying! I also had a dinner fail this week – I made some chili and put pumpkin in it, because I had gone to a cooking class where they did that, but I put too much in and it just tasted gross. We dumped the rest of the pot, and I hate to do that. Thankfully I had made some corn bread that night also that came out delicious, otherwise our whole dinner would have been ruined. It stinks when that happens while trying to stay on a budget! I agree that having to throw out food (if it didn’t turn out good) is the worst on this budget! When money is so tight there is very little room for error. We’re feeling the pinch too. Thankfully, I have a second job as a massage therapist. Although I’ve only been putting that cash to pay back my student loan, this weekend I had to cave and use a little to buy 2 loaves of bread, a gallon of milk, a whole chicken, cottage cheese, some bananas, lettuce and a marked down bag of tilapia ($2.23 what?! )… and a 6 pack of Pumpkin Ale. (Yeah, I know.) That should get the 5 of us through the week though, if I pull some stuff from the pantry and freezer. My husband however, is acting like he’s going to starve. He comes from a wealthy family who never says no, so he’s my biggest budget-buster too. As in “NO, I will not buy you gummy bears and Diet Pepsi when we don’t have any meat in the freezer and we’re out of milk and I have $5.” LOL! pfffthhht. I however came from a completely different family wherein my mom & grandma taught us to “make do.” The kids… they’re some where in-between and have been surprisingly open to all the “creativity” this sticking-to-a-budget-thing has “inspired.” Who knew?! I always try to use our chicken carcass for stock. It makes a super easy and cheap soup the next day by just adding in beans and some kale or spinach. Can you share your sauteed sweet potato/apples recipe? I have nots of sweet potatoes I need to use up and this sounds great! Thanks! Yes, I will post it either today or tomorrow (so make sure you are a subscriber if you want to get it in an email). It is very easy and good!! The oil drizzle wasn’t necessary, but my son particularly likes sesame oil and seeds, so I sprinkled some of each on his serving. In addition to peanuts, I am also allergic to eggs. I am unusual though, something like 95% of children who are allergic to eggs “grow out” of it before adulthood. For muffins, some cakes, cupcakes, anything that is baked in a pan that has a form, Energ-T Egg Replacer is an egg substitute that is dry powder sold in a box. It gets reconstituted with water before use, and I have a lot of success with it. I make a form of quiche with it by adding a little more of the binder(cheese, sour cream, whatever the recipe calls for) and a little less of the liquid. Use a crust, otherwise you will have filling, but it will not set up by itself without something to hold it. It works well for meatballs, meatloaf, anything in which the egg is a binder, rather than a leavening agent to make the recipe rise. Bar cookies and brownie types work well, drop cookies not so much. EarthFare, health food stores sell it, and I have found it at some traditional grocery stores from time to time. Its made of stuff like tapioca, potato starch, things like that, and it is not very expensive because a box lasts a loooooong time. 1 TBS and 3 TBS of water equal one egg, so you can see how something the size of a box of Bisquick would last! After reading this, I said to my daughter “Do you know cheese isn’t supposed to be orange?” She said, “What? Is that full of coloring also? 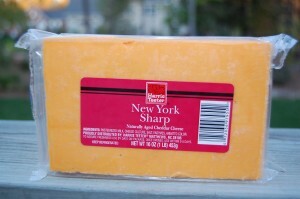 Great there goes my American cheese!” Many may think uh oh. I think wow, she knows it will not be bought anymore in this house and she isn’t arguing. Score another one for mom. I know I’m waaaaay late commenting on this but I just wanted to let you know that I CAN SO RELATE about the husband thing. I was first a budget shopper turned healthy/trying to eat more whole foods shopper (which as you know, is difficult). As a newlywed couple, we try to stick to a budget of $200 a month (we live in NC btw but not in your area. Totally jealous of your proximity to Charlotte. Always love going there). Anywho, EVERY SINGLE TIME…..he goes for the “best value.” And it KILLS ME. I have restricted which items he can go to the store for now because one time I asked him to pick up some roast turkey slices for us for lunch and he bought….dare I gag…. THE GENERAL BRAND PRE-PACKAGED BULK TURKEY. I refused to eat it but he said he’d eat it all over the course of the month (usually he’s the turkey sandwich guy anyway). It was so gross we ended up throwing a lot of it out. So much for being a “better bargain” eh? Hi, I have found your blog to be chock full of good information. I have not read every post, but I am trying to read thru the 100 days on a budget bc that is my whole life. I started looking into healthier food options when my son started school, and I realized his impulsivity was a problem in the classroom. Research led me to remove artificial colors from our diet, and it has made a big difference for our family. What you have expressed in this post is frankly whiny and spoiled. Most people in the world and many Americans do not have the luxury of spending $40 a month on special milk delivey or $4 a dozen on eggs or 30% of our budget on specialty cheeses. Most of us living on a budget dont have the choice to limit ourselves to only $125 a week. I feed my family of 5 on a$100 a week, pack all our own lunches, and try to make the healtgiest choices possible within that budget. That means we dont get the option to buy all organic or shop at Whole Foods for fancy crackers and snack foods. I noticed one of your posts mentioned you dont like beans. For most of the world, beans are the best protein you get on a regular basis. I am sorry for the rant, but for most working families, your budgt and choices are just not realistic. Hqving said that, I admit that I have not read to the end, and that this whole experiment is a learning process. As I finish, I hope to learn and grow alon with you. I thank you for bringing attention to his important topic of a corrupt food industry!